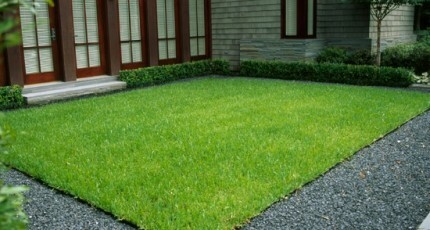 Residential landscaping by Exterior Worlds consists of so much more than simple yard and garden services. 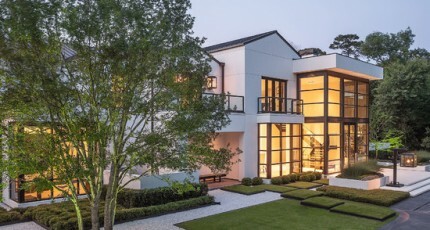 It involves the creation of special outdoor living environments through a layering of individual services and forms that ultimately creates an aesthetic that resonates with the passions, values, and lifestyle of the homeowner. Organic elements constitute the essence of residential landscaping. 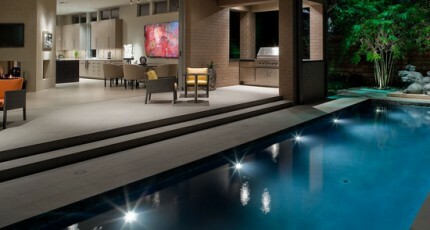 Living greenery and flora are the primary differentiating factors between indoor living space and outdoor living space. Without them, landscapes appear barren and sterile, devoid of vibrancy and energy. Even in styles such as contemporary landscaping where Nature’s importance is contained and minimized, organic elements still play a very important role in shaping an otherwise neutral landscape into a multi-dimensional expression of human thought over raw natural form. 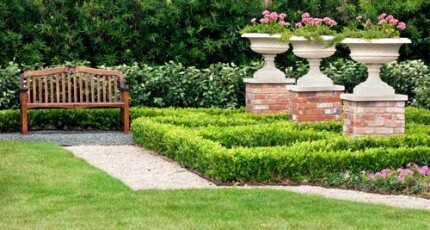 Garden design is perhaps the most varied and complex element of residential landscaping. Virtually every culture in the world has its own style of gardening that can be duplicated in the Houston area. Derivative forms of each garden type can be customized to specific properties in such a way as to make each planting a unique expression of homeowner taste and a direct compliment to the house and surrounding property. Tree management is another important component of successful landscape design. Trees of any type or size can be brought in and planted in even the most barren of yards. They can be used to provide everything from shade for gathering spots to borders between one lot and the other. Special tree services and preservation strategies are included in our residential landscape maintenance service contracts and are as important as lawn care services to the ultimate vitality and success of a particular property. Just as organic elements establish the essence of residential landscaping, hardscape design helps shape and develops its form and function. Patios built to accommodate specific events and anticipated numbers of attendees are vital to the success of any outdoor home entertainment function. Courtyards help separate different parts of the yard from the landscape proper—creating varying levels of intimacy and conviviality by their size, geometry, and positioning in relationship to the remainder of the landscape. Decorative walls serve a similar function by creating the impression that a lot is much larger than it normally is, and by providing vertical surfaces to which everything from flower beds, to smaller fountains, to decorative statuary can be added. Outdoor structures can then be built in correspondence to this network of walls, walkways and patios in a manner that congruently compliments home architecture and harmoniously blends with the organic elements of residential landscaping. For example, outdoor rooms are often built out of a combination of custom masonry walls and hedges. 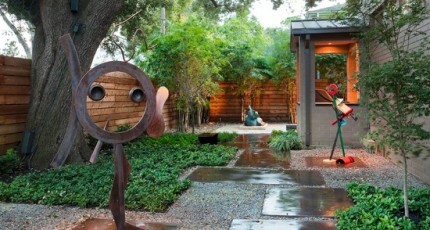 Wooden arbors are built adjacent to trees so their wooden frames will appear part of the living expression of the yard. Actual covered rooms such as summer kitchens and outdoor living rooms are positioned in such a way as to geometrically counterbalance gardens, pools, open seating areas, and the house proper. The ultimate success of a residential landscaping plan is often determined by the type and variety of water features that are then added to the property. Almost all human beings love water to some extent. Some may not like actually getting in the water per se, but virtually everyone likes being near it. Custom swimming pools rank chief among water elements that serve both a vital social and aesthetic role in the overall presentation of the design. A well-designed swimming pool reflects the geometry and sensibility of the house and provides visual linkage between the home and the remainder of the property. 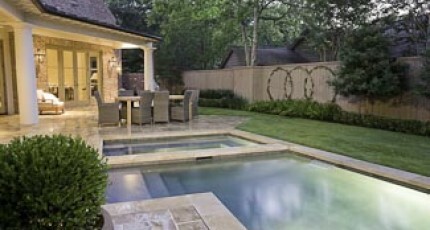 Pools can even be constructed to mimic natural ponds like the ones we commonly see in wilderness areas. Diving areas can be made to look like small cliffs. Waterfalls with hidden pumps can be sculpted into the design to provide the illusion of a free-flowing water source. Vegetation can be planted around the edges to make the scene look pristine and unexplored. Residential landscaping crews also pay close attention to the need for the decorative and soothing effects that water has on the senses. Custom fountains can be built anywhere in a yard that provide everything from focal points for public seating areas to private spots for contemplation, meditation, and repose. 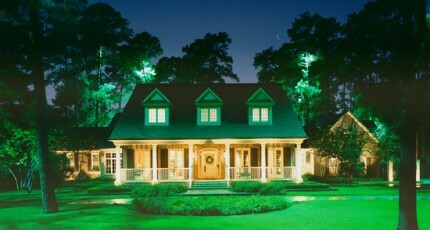 Outdoor lighting plays not only an important role in residential landscaping, but in many senses of the term, a defining one as well. Home lighting fixtures illuminate the house as the preeminent feature on the lot and help set the tone for the aesthetic of the property as a whole. Garden lights of all varieties allow guests to see even the smallest details of the most ornate and formal designs even on the darkest nights. Pool and fountain lights of all varieties can be used to illuminate the water and create a myriad of special effects that will contribute ambience and mood to outdoor gatherings and special occasions. By concentrating on achieving a balance of all of these many and very important elements of residential landscaping, Exterior Worlds is able to offer the discriminating Houston homeowner both an aesthetic expression of personal values and mindset and a very real and functional outdoor living environment that functions as a virtual home outside the home, and a better return on property value investment as a sustainable environment that can be passed on to future owners and professionally maintained on an indefinite, ongoing basis. Maybe you’ve been collecting residential landscape designs for a while. 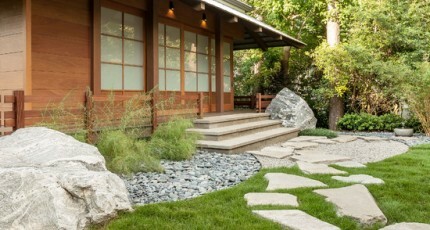 Perhaps you saw a Japanese garden design at a friend’s house that captured your imagination. Or maybe it was a Mediterranean garden design with sweet herbs right off the vine, relaxed spaces for entertainment, and lush, practical vegetation. Possibly your space is limited and you’re looking for small garden design ideas that will have a big impact. 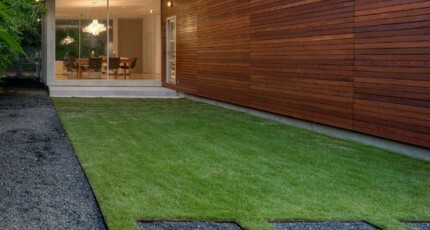 The residential landscape architect is a true architect in every sense of the word. He or she studies construction theory and home design in order to identify the geometric forms that are common to both the natural world and the creations of man. This understanding enables the designer to better unify organic forms with home architecture and construct outdoor structures that compliment the house and blend harmoniously with organic elements.